Several influential Republicans and Democrats have bluntly told top Pentagon officials that the budget caps known as sequestration are unlikely to change anytime soon, suggesting that the painful across-the-board budget cuts may hit the military again this fall. "Even though I believe in miracles, it is becoming very clear to me that … the Budget Control Act funding levels will be the law of the land," Rep. Betty McCollum, D-Minn., said. McCollum was referring to the formal name of the 2011 law that established sequestration, a concept that military planners detest because it automatically lops a certain arbitrary percentage of funding from every defense budget account, with no flexibility allowed, in an effort to reduce government spending. Rep. Ken Calvert, R-Calif., delivered a similar message. "The [Budget Control Act] is the law of the land. Until that's changed, we must abide by it. So we have a serious funding gap between the strategy and the law," he said. The gruff message came March 4 as Defense Secretary Ash Carter and other top defense officials appeared for their annual testimony before the House Appropriations Committee's defense panel, a powerful group of lawmakers who hold unique sway over the Defense Department budget. Carter echoed the now-familiar calls for the Congress to repeal the law. "We would have to change the shape and not just the size of our military, significantly affecting parts of our defense strategy. 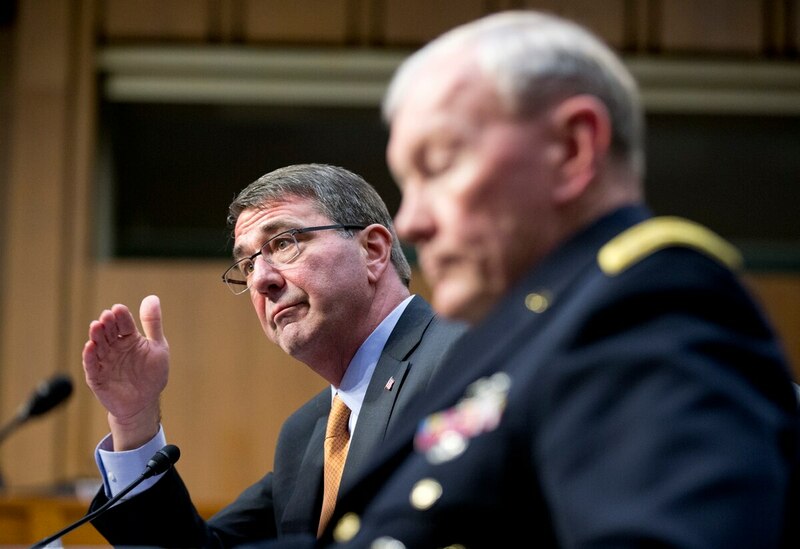 We cannot meet sequester with further half-measures," Carter said. "If we're stuck with sequestration's budget cuts over the long term, our entire nation will have to live with the answers." But Carter was repeatedly told by lawmakers that the Pentagon should plan for the budget cuts sooner rather than later. That standoff stems from President Obama's budget request for fiscal 2016, which begins Oct. 1. That budget request is $38 billion over the sequestration cap. Rep. Kay Granger, R-Texas, told Carter: "I would beg you to be the person that says, 'Tear up that president's budget because it assumes that there's no sequestration.' "
The negative sentiment from the Republican-controlled House Appropriations Committee highlights the fierce battle taking place within the GOP, where tea party loyalists and other budget hawks seeking to rein in military budgets are locking horns with more moderate Republicans who support robust spending on national security. Those GOP defense hawks are supporting the Pentagon's budget request and have urged their party to vote to suspend the sequestration caps and grant the Defense Department the budget flexibility it seeks. Rep. Mac Thornberry of Texas, the Republican chairman of the House Armed Services Committee, which also plays a key role in the Pentagon's budget, firmly supports lifting the spending caps for the military. Army Gen. Martin Dempsey, chairman of the Joint Chiefs of Staff, told lawmakers that if DoD does not get the full amount requested, the Pentagon will have to rewrite the current national security strategy that aims to keep a robust military presence around the world and shift more resources into the Pacific region. "If we don't get that [money], the strategy's going to have to change. So if you ask me how I will manage the current strategy, it's unmanageable" under the current budget caps, Dempsey said while testifying alongside Carter before the Senate Armed Services Committee on March 3. Many lawmakers said they support lifting the budget caps, but are resigned to the possibility that it may be politically impossible. "I completely agree that the [sequestration law] needs to be modified to avoid dramatic consequences and long-term negative impacts on our military capability," said Rep. Rodney Frelinghuysen, R-N.J., chairman of the House Appropriations Committee. "But unless and until the law is changed, this committee has no choice but to draft our bill to comply with the caps, at least $37 billion below the president's budget request. "So we'll need to work very closely together to ensure the funding you are appropriated is sufficient to take care of our uniformed and civilian personnel, maintain your readiness at the highest possible level, and sustain our technological advantages," Frelinghuysen said. Andrew Tilghman is the executive editor for Military Times. He is a former Military Times Pentagon reporter and served as a Middle East correspondent for the Stars and Stripes. Before covering the military, he worked as a reporter for the Houston Chronicle in Texas, the Albany Times Union in New York and The Associated Press in Milwaukee.